Several years ago, our eldest son was just coming to the age where he could understand the true meaning of Christmas at a deeper level. I wanted to start doing the four Sundays of Advent with our family, but the traditional service I had grown up with was too hard for our kids to grasp, and I realized I needed something simpler. Out of necessity I pieced together a simple service for each of the four Sundays of Advent, plus Christmas Day (when it falls on a day other than a Sunday). I called it “Advent for Preschoolers” and our family has used it for the past 3 or 4 Advent seasons. I have tweaked the lessons slightly each year based on what has worked with our kids and what doesn’t. I would like to make this a free PDF link, but I can’t figure out how to do it. (I think Blogger may not support such high-tech options!) So I am posting the first Sunday of Advent here on my blog, and please email me at carolyn@carolynbroughton.com for the complete FREE 15-page “Advent for Preschoolers” PDF file (including optional Christmas carols) for you to use with your family. Each Sunday of December, our family lights another candle and prepares for Jesus’ coming: both His coming to earth as a baby at Christmas, and His coming back to earth again as our King. This year (2013) on the first Sunday of Advent we were reading through Week 1 with our kids. As we read, our three-year-old began absorb the fact that Jesus was really coming back to earth one day. At the literal age of three, having a relationship with Someone you can’t see is continually frustrating. I was a bit afraid he was starting to think Jesus was coming back to earth this Christmas Day, and tried to explain that no one knows the day or the hour of His return... But I felt a glow of warmth that even at three, he was absorbing these important facts about Jesus, through our family Advent worship. 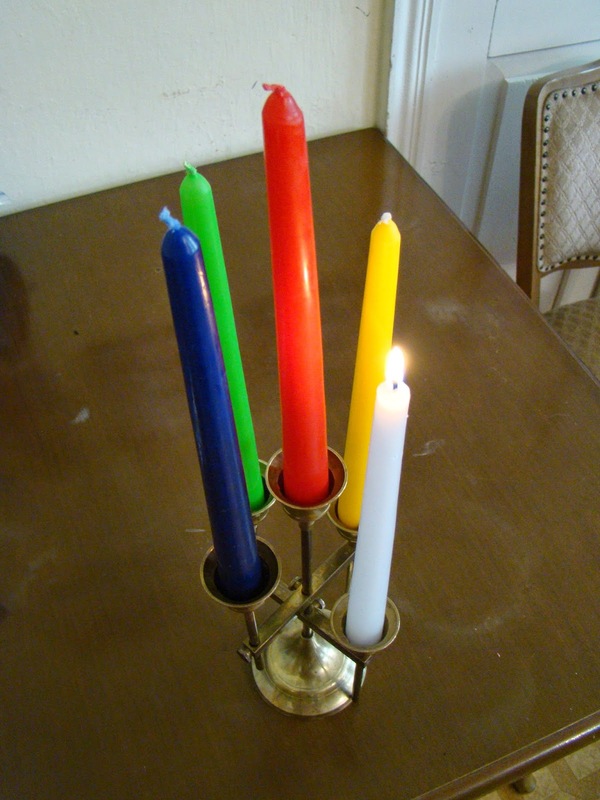 Some families use four white candles with a red one for Christmas Day. Feel free to use whatever suits your family. May you be blessed as you read through these weeks together, and may you draw closer to Jesus together as a family this Advent season! Mother: The season of ADVENT begins on the fourth Sunday before Christmas. ADVENT means "COMING" or “ARRIVAL”. Whose coming to the earth do we celebrate on Christmas Day? Mother: Right! During ADVENT, we get ready to celebrate the “arrival” of God’s Son Jesus as a baby. We also get ready for Jesus to come back again as our King. Let’s start getting our hearts ready for Jesus’ coming. Mother: What are these on the table? Child: Candles! Mother: Do you know why we light candles during Advent? Candles remind us that Jesus is the LIGHT of God coming into our dark, sinful world. Remember? Jesus said, “I am the LIGHT of the world.” Every Sunday of Advent, we light one more candle to prepare for Jesus’ coming. Father: Do you know the name of the first candle? The first candle is called “The PROPHETS’ Candle”. It reminds us of the PROPHETS in the Bible who foretold Jesus’ birthday hundreds of years before He was born. 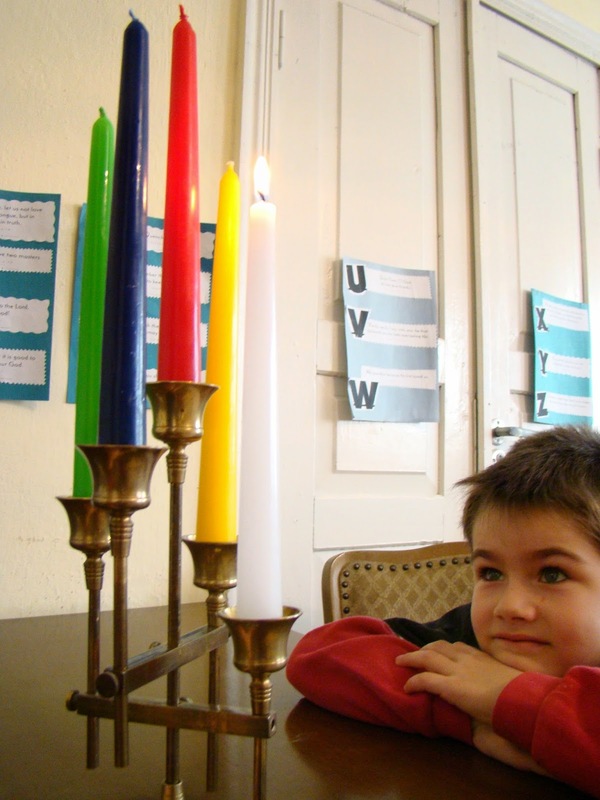 Do you know what the Prophets’ Candle means to us? It reminds us of the HOPE God’s people had as they waited for the coming of a Messiah, a Savior. God showed His prophets that He was planning to send a Savior for His people. Do you know who that Savior was? Father: Right! God’s promise to send a Messiah, a Savior, was fulfilled when He sent His Son Jesus to earth. But do you still see sin and darkness in the world? Father: So we are still waiting with HOPE, like the prophets and God’s people in the Bible, for Jesus to come back again to make the world new and get rid of sin forever. Who is the child who is born, the son who is given? Child: Jesus! Father: So, we light the PROPHETS’ candle to remind us that Jesus’ coming was foretold by the prophets, and that Jesus brings LIGHT and HOPE into a dark world. Thank you for coming into the world just like the prophets foretold. Thank you that you are the light of the world, and you bring us hope. Thank you that you will come back again to make the world new and take away sin forever. Come, thou long expected Jesus! born to set thy people free, from our fears and sins release us let us find our rest in thee. Israel’s strength and consolation, hope of all the earth thou art, dear desire of every nation, joy of every longing heart. Born thy people to deliver, born a child and yet a king, born to reign in us forever, now thy gracious kingdom bring. By thine own eternal Spirit, rule in all our hearts alone.